A driver turns right from Gibson Hill on Crocker Lane. Another roundabout may be in North Albany’s future if an informal survey accurately reflects what people want and the city council follows their advice. But it’s far from unanimous, and in their written comments the survey respondents are giving the council all kinds of conflicting views. The city council asked for public input before deciding what kind of traffic controls to install at Gibson Hill Road and Crocker Lane, a T-shaped intersection where delays are becoming more frequent as the number of North Albany houses, residents and commuters expands. The council called for a public meeting, and since this story first was published here, the open house has been scheduled for Tuesday, April 26, 4-6:30 p.m., at City Hall. On the city’s website (cityofalbany.net) there’s a page showing five possible intersection treatments and asking people to pick their preferences. As of Tuesday, 294 people had given their opinions, but not all were such that they could be counted. One, for example, showed four of the choices as fourth-best and the fifth as worst. Among the responses tallied so far, 117 opted for a “modern” or full-size roundabout, which consulting engineers estimate would cost $1.4 million and require the acquisition of quite a bit of property on all three sides of the junction. In second place with 56 votes was a set of traffic signals with turn lanes, costing almost $1.9 million. A small roundabout costing $282,000 was third with 49 votes. Traffic signals without turn lanes would cost $538,000 and got 39 votes. The least expensive option – at $9,500 practically free in comparison – was the choice of a mere 34 online survey clickers. The survey itself is flawed and poorly designed. There are only 4 options and 5 choices. You end up selecting two “least preferred” choices before it lets you submit it. I am unable to find the 5 options for the Gibson/Crocker intersection. Can you direct me to the link if it is still available? If it is no longer available, I will give my 2 cents. I live on Laura Vista in the Benton Woods subdivision. From Scenic to Crocker the speed is 45. That should be reduced from 45 to 35 at the fire station and then remain at 35 all the way to the Gibson Hill roundabout. People in the USA do not understand roundabouts. They work great if people know how to use them. 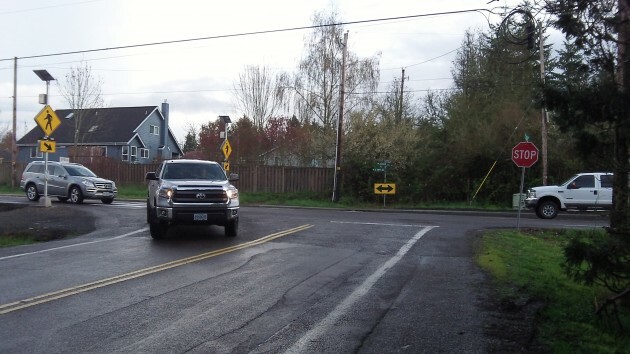 A three-way stop at Crocker would only work if all speeds are the same. Currently they are 40 to 45 on Gibson and 35 on Crocker leading up to Gibson. I would be interested to know how many accidents have occurred at that junction in the past 5 years. The link, still available this morning, is: https://www.cityofalbany.net/departments/public-works/engineering/crocker-intersection. Personal opinion (entered in the survey) is that speed limit changes combined with one of the signal options would fix most of the issues. “100% Correct!” My experience is that this is 100% incorrect. I use the roundabout at Gibson Hill and North Albany nearly every day of the week. For the first month or so after it was installed I recall encountering a few confused drivers, and virtually none since then. Although I use it far less frequently, my experience with the new roundabout on Main is roughly the same. If you encounter a significant number of confused drivers at traffic circles, you have to ask yourself if the problem lies between the steering wheel and the driver’s seat of your car. We obviously see different folks going through the roundabouts. The vast majority of folks I see *never* use their turn signals at any point — and that is a basic safety issue IMO. Scroll down to February 3. Roundabouts are not consistent with American culture. Americans value speed and power; roundabouts require slowing with no passing allowed. Americans believe in the divine right to cut other drivers off; roundabouts require yielding. Americans value independence and freedom; roundabouts require sharing and signaling. Americans want choices; entering a roundabout requires looking left, exiting requires turning right, and no stopping allowed in-between. Seems clear to me – roundabouts are simply un-American. This is just priceless from you. You have often shown stupidity, but to equate an engineering approach with patriotic intent just shows how absurd and irrational you are. Bob is trapped in his own mind’s roundabout…. Since there is no font for sarcasm, you should suggest one, some obscure font in italics perhaps.